Disclaimer: Patient education is very important, however this site is a guide to help patients understand their condition and does not replace years of training and clinical experience. Before an appropriate treatment can be instigated, first and most importantly, one must make the correct diagnosis. Often this can be achieved by simply taking a history and doing an examination. To aid in the diagnosis, we can use radiology (x-rays, CT, MRI, ultrasound, etc). Each of these different modalities are used to look for different things. Depending on the condition, it would be incorrect to use some of these modalities for a given condition, as it may not help the diagnosis and may place patients in harms way e.g. radiation with an x-ray or CT scan for a soft tissue concern. A doctor will usually start by making a differential diagnosis. A differential diagnosis is a list of possible diagnoses listed from most likely to least likely. This however, is only possible if you know a whole list of diagnoses. For a medical student or a non-medic however one must approach the problem from a different way. Anatomically is the best method. Identifying the pathological anatomy is the most important factor when using this easy technique. At first, you do not need to know what, exactly the anatomy is, you just need to identify where, the anatomy is. One must pay very close attention to exactly where the problem is, or the biggest problem (e.g. the most pain). Normally there will be one area of pathology causing many / diverse symptoms as opposed to many discrete areas of pathology. Pain: Sometimes it is hard for people to exactly localize their pain, it may feel that it is around a general area, or radiates to different places. This is very common. It is best to try and find the site where the pain is the worst, ideally to be able to put one finger on the worst spot. The more spots of ‘the worst’ pain the harder it is to make a diagnosis and give the best treatment. If you look hard enough often you will find one spot where it is the worst. Clicking: Some joints click and are not painful, so usually do not need any treatment and will not cause any long term problems. Painful clicking however needs further evaluation. If one can identify the exact point of clicking or where the pain is when it clicks this is ideal. Catching / Locking: This is usually a very specific symptom and depending where it is in the body, it may be very easy to make a diagnosis. Stiffness: This is a very common symptom, especially after an injury. It is also one of the first signs in arthritis, although people may not know that their joint has a decreased range of motion. Luckily most joints have an opposite joint with which you can compare. 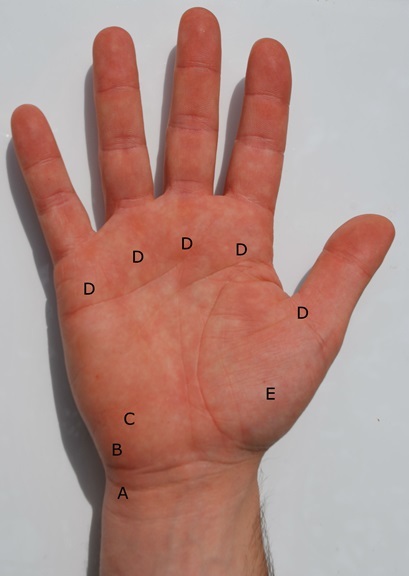 If your hand is stiff, try to identify exactly which joint(s) are stiff. Numbness / Tingling: This will normally occur in the distribution of a sensory nerve. Identifying exactly where the numbness is, is vital, exactly which fingers. Commonly people say ‘it is my whole hand’, normally because they have not paid acute attention when the symptoms are present. During the symptoms pay distinct attention to exactly which fingers or sides of fingers are involved. Weakness: This can be a vague symptom and have many possible diagnoses. It is important to figure out exactly what is weak. Find specific tasks that you find difficult. Is it pain that causes weakness? Or does it just not work? Swelling / Deformity: These are common all over the body and can usually be pointed out to your doctor very easily and diagnosed quickly. Swellings in certain areas are characteristic of certain conditions. Other: Occasionally one cannot put a label on what is wrong, it just doesn’t feel right, it feels unstable, it gives away etc. Again you can still identify more information if you really concentrate on anatomy and exactly when it is a problem, “my wrist gives out when I go to the gym” is less helpful than, “my wrist gives out secondary to pain, when I am lifting a dumbbell at the gym, with my elbows at right angles with palms facing together and I deviate my wrist to the little finger side – ulnar deviate”. Learning the entire anatomy of the body, takes years. If you are focusing on a specific area of a problem, then you can often learn the required anatomy in minutes. Below are common sites of pain. – a condition does not always present in the same way in every patient. 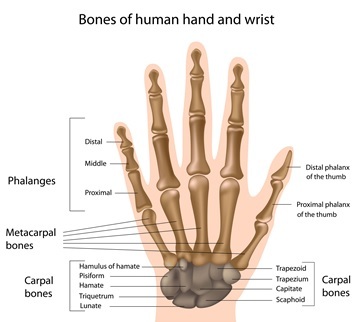 The picture below shows the bone anatomy of the hand. Any bone can be fractured, or the joints between can become arthritic. Arthritic joints often start by having swelling and a decreased range of motion plus / minus pain. This can progress to deformity and / or dislocation of joints. 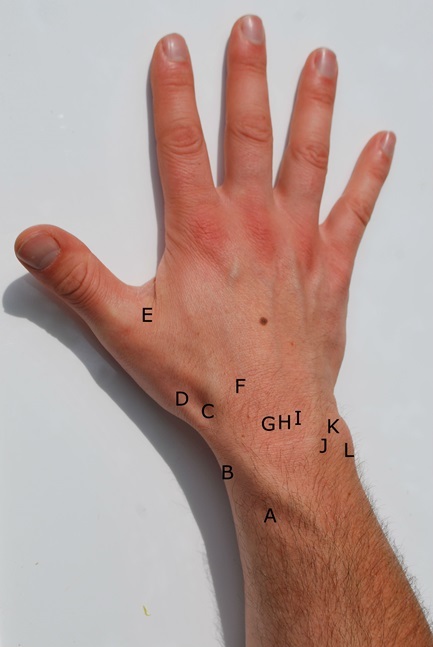 By identifying certain areas that have characteristic spots that cause pain. These painful areas are usually quite discrete. 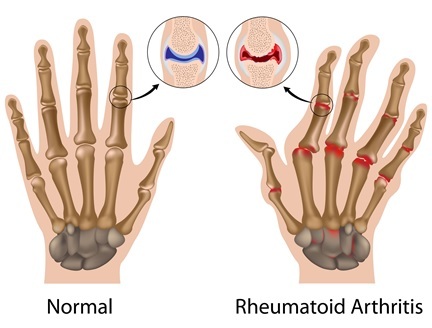 Arthritic processes such as a SNAC or SLAC wrist, mid carpal instability or rheumatoid arthritis can present with global pain around the wrist.